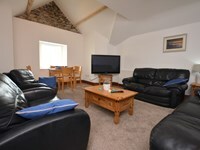 A mile-long sandy bay situated at the end of the Llyn peninsula.. The bathing water is located in a sheltered bay, south facing, and is predominantly sandy in nature with a pebbly foreshore. 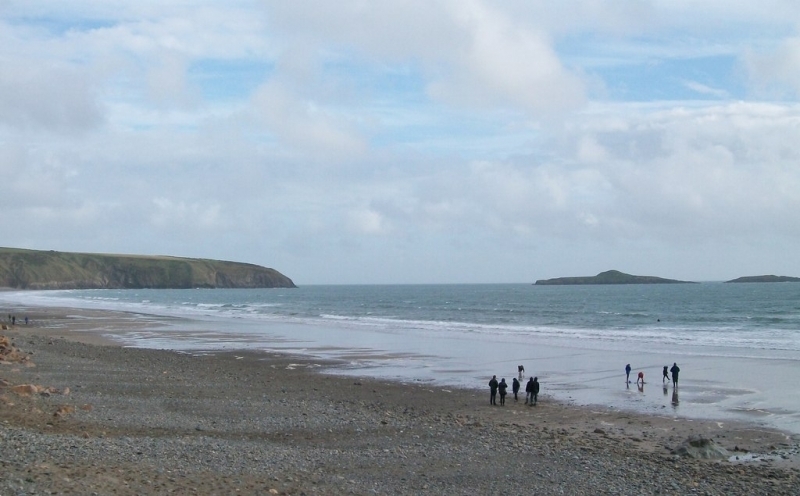 The beach is backed by the village of Aberdaron, and then agricultural land. The bathing water lies in the Lleyn Peninsula and the Sarnau Special Area of Conservation. To the west is the Glannau Aberdaron Site of Special Scientific Interest and to the east the Wig Bach A'r Glannau I Borth Alwm Site of Special Scientific Interest. Aberdaron Beach is adjacent to the Llyn Peninsula Coastal Path and the Wales Coast Path. The tide at Aberdaron Beach is currently falling. Low tide will be at approximately 5:05 AM tomorrow, and the next high tide will be at approximately 10:19 AM tomorrow. Parking available - a charge applies. around 12 miles northeast as the seagull flies, around 14 miles by road. around 9 miles east as the seagull flies, around 13 miles by road. Visitor information for Aberdaron Beach, Gwynedd, Wales. Weather, tides, visitor comments, beach facilities, photos, nearest postcode, beach information and nearby accommodation.